2 Timothy 2:2 (KJV): And the things that thou hast heard of me among many witnesses, the same commit thou to faithful men who shall be able to teach others also. When it comes to ministry towards the saints, there are variations and distinctions in the levels of understanding of the people we share and minister to. Over the years, I have learnt that there are certain things that God will reveal to you that cannot be shared or committed to just anybody because those very things require faithfulness from the men you share and commit them to. Paul, in our theme scripture, admonishes Timothy to commit the things he has heard of him among many witnesses to “faithful men who shall be able to teach others also” because when a man is faithful, that man has a grace at work in his life to teach others also. 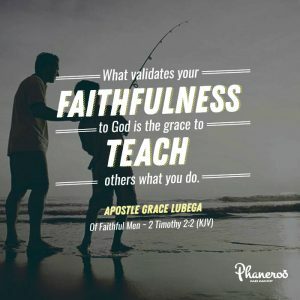 What validates your faithfulness to God is the grace to teach others what you do. God has entrusted and committed many things to you but how faithful have you been in those things? You may be gifted in prophecy, teaching or the working of miracles but have you taught others to do the same? Sadly, we are living in a generation where men exalt gifts above faithfulness yet it should be faithfulness above the gift. When a man is faithful, he can teach others but a man gifted yet without faithfulness can not teach others. That is why some people can make the lame walk by reason of the gift but can not teach others how to make lame men walk. Some can prophecy by the gift but they can not teach others how to prophecy and that is an imbalance in the spirit . Be gifted but also have an ability to teach; and this grace to teach functions in faithful and not merely gifted men . What validates your faithfulness to God is the grace to teach others what you do. PRAYER: Father God, I thank you for who you are to me. You are the centre of my life, the reason I live and breathe. Thank you for the things you have entrusted me. I thank you too for the grace to teach others these very things. I am a faithful steward of your household. I am exercised in this reality every day. In Jesus’ name. Amen.